How did Baker’s experience as a practicing lawyer prepare him for negotiations on Capitol Hill? What skills or practices did Baker employ to achieve compromises on Capitol Hill? 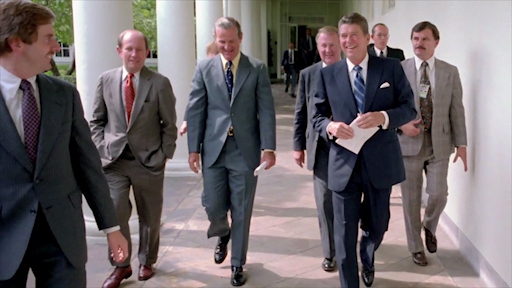 President Ronald Reagan entered the White House in 1981 with an ambitious legislative agenda. He wanted to focus on small government, lower taxes and increased military spending. The Reagan team knew they would have no difficulty passing their agenda through the Senate, which had a Republican majority at the time. But the Democratic-controlled House of Representatives was another story. Reagan would need a chief of staff who knew the ways of Washington to help get his agenda through the House. Even though Jim Baker was less conservative than Reagan and had campaigned against him twice, he was ideal for the job. Before dealing with the Democrats, Baker had a delicate matter to deal with in the White House. 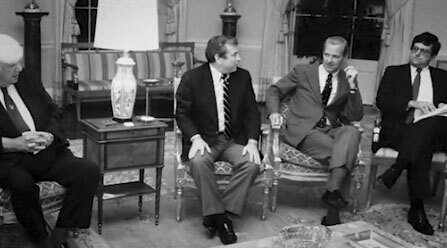 Although Reagan selected Baker as his chief of staff, the president also wanted to give his long-time friend and aide Ed Meese a powerful role. It was left to Baker to negotiate with Meese the roles of the two jobs. The two men created a document outlining each man’s duties. Baker made sure Meese was satisfied by giving him Cabinet-level status, but he assured his own authority by building in his ability to almost always have the last word with the president. Once his job responsibilities were nailed down, Baker turned his attention to Capitol Hill. Baker’s philosophy was to categorize issues into one of three categories: impossible; the tough but doable; and the easy. He left the easy ones for others to solve and set aside the ones that seemed impossible. He focused on changes that he thought were tough but doable. For this, he fell back on his well-honed negotiation skills. Looking back today, Baker likens the compromises he brokered to horse-trading: “Sometimes a representative wants to trade his vote for something for his state, for his district. Well, you do that,” Baker says. Baker’s diligence on the Hill paid off. Congress approved huge spending and tax cuts, as well as a bill to expand the military. But tension was growing inside the White House. Reagan’s conservative team members bristled at Baker’s more moderate politics. The stress began to take a toll on Baker. After Reagan won reelection in 1984, Secretary of the Treasury Donald Regan approached Baker with a proposal to change jobs. The two men discussed the plan with the president, and Reagan agreed to it. Baker would no longer be Reagan’s chief of staff. Instead, he would be the secretary of the treasury. James Baker was extremely adept at negotiations. Learn how he helped President Reagan bring about tax reform. 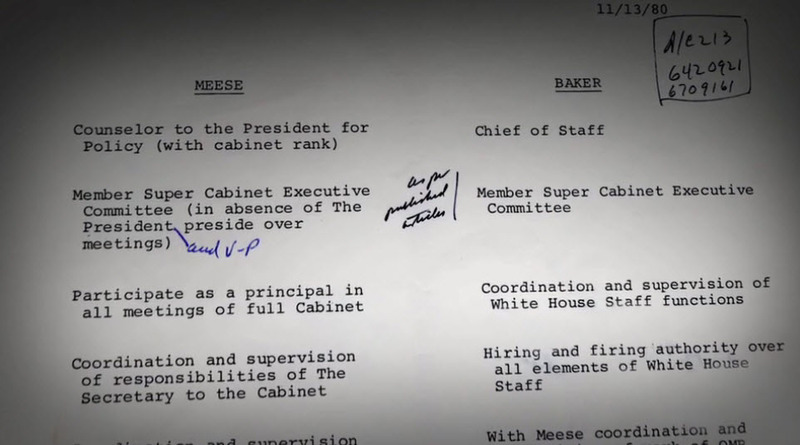 Under Ronald Reagan, Baker and Meese shared power. The two men created a document outlining each man’s duties. This website is a production of Maryland Public Television/Thinkport in collaboration with Spy Pond Productions for John Hesse Productions LLC. © Copyright 2014 John Hesse Productions LLC. All rights reserved.